called into question by the suggestion that Irvine was “made famous by the hit show The OC,” which, as I recall, was set in Newport Beach, not Irvine. 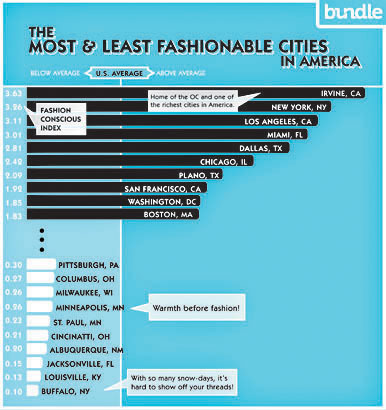 We selected the 50 largest cities by population in our data set and created a fashion-conscious index, with 1.0 being average. We based our index on the percentage of “fashion-conscious households” in our sample, which we defined as households that had at least four transactions at top-end designer merchants in the past 30 months. Okey dokey. Basically, if you have lots of people who buy clothes at expensive stores, that makes you “fashionable.” This is, needless to say, a debatable proposition. What’s more, if you click on “50 Places in the OC that the Fashion-Forward Frequent,” you get lots of shops in Beverly Hills and Los Angeles and virtually none in Orange County. And it turns out that the Bundle folks are also the source of the Mail’s confusion about American TV, calling Irvine “Home of the OC.” So I think we can all take this with a grain of salt. I suspect that even the Irvine Chamber of Commerce will have a hard time making a silk purse out of this particular sow’s ear.